It’s that time of year again, time to launch our 43 Day Campaign! Last year marked our first 43 Day Campaign, with a goal to raise $43,000 in 43 Days. Thanks too all our supporters for helping us beat this goal last year! With the funds raised from last year’s 43 Day Campaign, the Lutzie 43 Foundation has been able to increase our impact. Read below for a full recap of 2018 and everything we were able to accomplish from funds raised during the 2017 43 Day Campaign. We were able to double the number of Prepared for Life Scholarships awarded last year. We awarded ten PFL Scholarships to students like Abigail Bridges, who are positive ambassadors for change in their community. Watch Abigail’s video about what it meant to her to be awarded the PFL Scholarship. 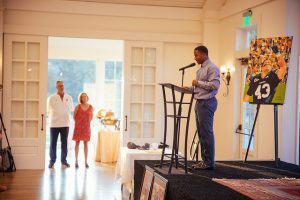 The foundation hosted our first Auburn Weekend. Thanks to your contributions, we were able to add on a whole new event to our offerings. Our Auburn Weekend featured an Adaptive PE Field Day, a flag football tournament and a 5K run. We partnered with Greek organizations at Auburn University to assist with operations and promotion. Mike Lutzenkirchen was asked to speak at the Under Armour All-America Game in Orlando, Florida for the second year in a row. At this event, Mike spoke to the young athletes about character development and the importance of using their platforms to make a difference. The Lutzie Foundation both hosts and provides transportation for Adaptive PE Field Days, field days for students with special needs. Finding bus transportation that has built-in wheelchair lifts is incredibly expensive for schools, so the Lutzie 43 Foundation covers this charge for schools as well. This year the Lutzie 43 Foundation hosted three Adaptive PE Field Days, two in Cobb County and one in Auburn. We host over 700 kids and 70 teachers and staff. Thank you for helping us put smiles on students’ faces! The launch of the 43 Key Seconds, safe driving initiative would not be possible without the donations raised during last year’s 43 Day Campaign. The goal of our 43 Key Seconds initiative is to create a nationally recognized symbol for safe driving and distracted driving, we want to have the physical 43 Key Seconds key in the hands of every driver to remind them to stop and prioritize safety behind the wheel. We want to encourage teens to be positive ambassadors for safe driving in their community. This year, we want to add even more PFL Scholarships awarded, increase the number of drivers that have the physical 43 Key Seconds key, host another Auburn Weekend and increase the number of Adaptive PE Field Days that the foundation hosts. We need your help this year so we can impact even more people next year! If you would like to donate to our 43 Day Campaign, please click here. Thank you for your continued support, truly we would not be here without you!